I have just published the second timeline of November, and so it’s now time to publish the corresponding statistics. As usual, the statistics are derived from the cyber attacks timelines that I try to publish on a bi-weekly basis. So, let’s start from the Daily Trend of Attacks chart, which appears quite unbalanced towards the first half of the month (please notice the trend line): this month has begun with a high rate of attacks (or news related to attacks) and has gone progressively decreasing. Maybe the crooks prepare themselves to the holiday season. 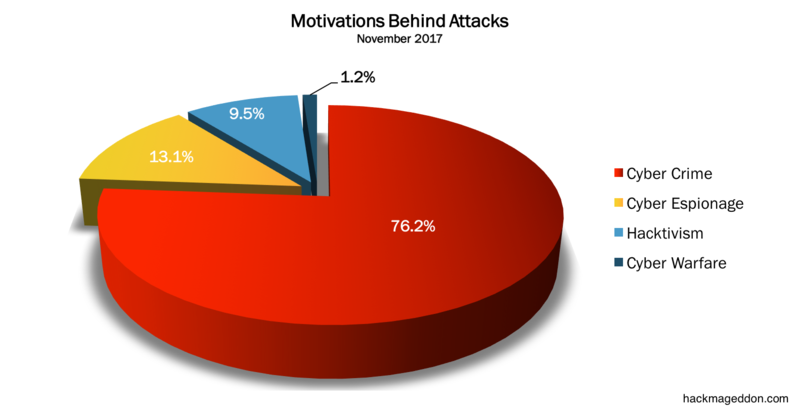 And, unsurprisingly, Cyber Crime leads the Motivations Behind Attacks chart with 76.2%, essentially stable with the value reported in October (73.4%). Cyber Espionage is stable at number two, but its values drops to 13.1% from 21.3%. Hacktivism shows some signs of life, and achieves a remarkable 9.5% from 4.3% of October. Cyber Warfare is stable to 1.2% in line with the values of the previous two months. The Attack Vectors confirms malware on top with 35.7% (it was 23.4% in October), ahead of targeted attacks down to 14.3% from 23.4% (back to the levels of September). Account Hijackings are stable at number three among the known attack techniques with 13.1% (it was 17% in October). And once again, Industrial targets lose the sceptre of the Distribution of Targets chart in favour of Single Individuals (respectively 19% vs 32.1%) that are back to the value of September (when Industry was 13.2%. Financial and Educational targets are at the same level (7%) ahead of Governments (6%). The Industry Drill Down Chart is extremely fragmented lately, showing a variety of targets.